In addition to providing our patients with high-quality dental care, we also offer several specialised services to address common sleep-related concerns. Our treatment options can significantly improve one’s quality of life. Do you experience bruxism or teeth grinding? If it’s uncomfortable to chew or talk, you may have this disorder. If left untreated, your teeth can wear down and you may suffer from severe pain in the shoulder, jaw joint, head and neck. At Dentist Melbourne in Toorak, we can provide highly effective solutions to address these issues. Learn more about teeth grinding. Considered a serious sleep disorder, sleep apnoea occurs when a person’s breathing is interrupted during sleep. Someone with sleep apnoea may make gasping or choking sounds. While a CPAP (continuous positive airway pressure) machine is a conventional way to address sleep apnoea, we can custom-create sleep appliances to help you sleep soundly—without having to wear a mask. Learn more about sleep apnoea treatment. Do you grind or clench your teeth and wake up feeling groggy or unrefreshed? Does your jaw click when you eat or open and close your mouth? Or perhaps you experience daily headaches and jaw pain. 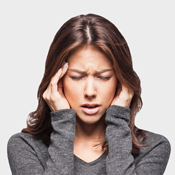 You likely are experiencing TMJ (temporomandibular joint) problems, also referred to as temporomandibular dysfunction (TMD). We can address your TMJ by realigning your bite. As a result your symptoms may subside. If you are suffering from any of these conditions and have been looking for effective solutions, we want to help you. Contact us today to book an appointment! All health funds are accepted, and we also offer an interest-free payment plan from DentiCare.